Getting concrete to set up fast is one thing – getting it to last – long into the future – requires a mastery of many variables. 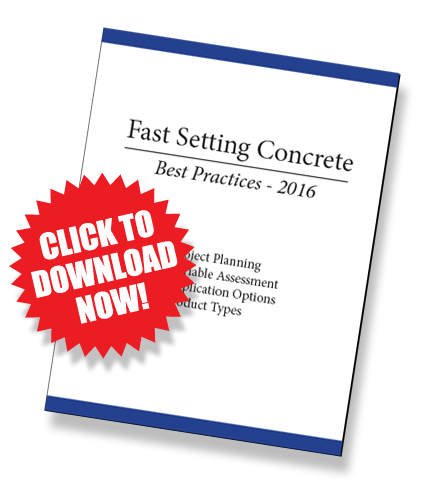 Download our Best Practices for Fast Setting Concrete white paper to learn about the leading causes of rapid setting concrete failure, and what you can do to protect your reputation and deliver solutions that stand the test of time. Fast setting concrete is commonly used for repairs and applications where it’s time is critical. Contractors performing street, highway and bridge repair need to get in, get done, and get out fast to reduce traffic disruption. Airport runway repair is very time-sensitive. Military bases, operations and facilities are very time-critical. Even something as seemingly simple as sidewalk or parking lot repair can require a tight time frame, and fast setting concrete comes into play. In each case, speed is essential, but structural integrity and durability are of paramount importance. While there are various ways to expedite the setting and curing time of concrete, its wise to know the pitfalls associated with some solutions, and the various options and application techniques to deliver the best long-term result.